After a hot summer enjoying your favorite grilled foods with family and friends, it’s hard to give them up, right? 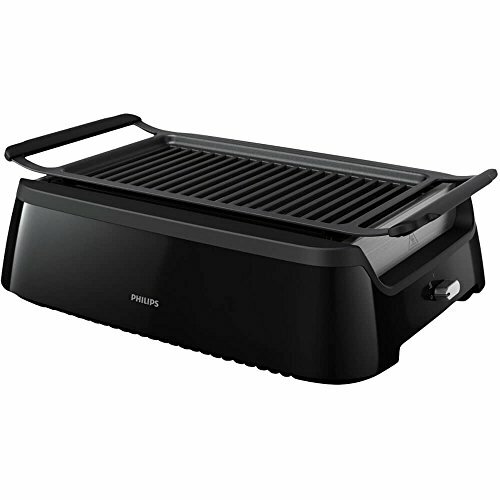 Of course, however, now you can get a nice grilled flavor without the outdoors fuss with one of our fall appliance – the Philips Indoor Smokeless Grill model HD6371/94. A worthy investment as it cooks a variety of food perfectly and healthy, minus the smoke. You can have barbecued foods any time, rain or snow. Meats – with Philips indoor grill it took less than 10 minutes to cook a chubby steak to a medium-rare doneness and the meat retained its juiciness. Marinated chicken and pork sausages came out tender and moist. Seafood prawns and fish are perfectly grilled in only 5 minutes. They become succulent and tasty and keep their sea flavor. Whatever you cook, they are always beautifully seared on the outside and juicy on the inside. 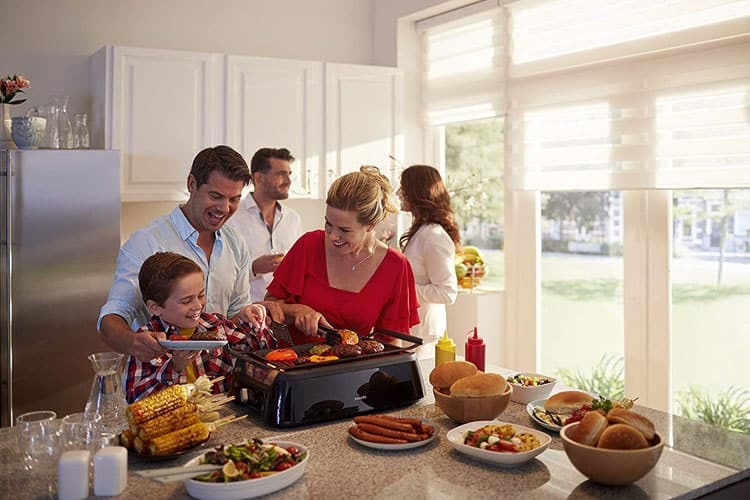 Philips Indoor Smokeless Grill model HD6371/94 produces up to 97 percent less smoke (80 percent when you’re grilling meat) than conventional electric grills. That means, you can do the grilling anywhere in the house, even rooms with no ventilation, without having to “fight” with suffocating smoke. Vegetables – a majority of vegetables are perfect for cooking on the grill. Corn is the summer classic, but asparagus, eggplant, bell peppers, zucchini, onions, mushrooms, and tomatoes can be grilled to perfection. When grilling multiple vegetables at the same time, it’s important that they all have similar cooking times. Sliced tomatoes and mushrooms were well roasted in under 15 minutes and sported perfect grill marks. 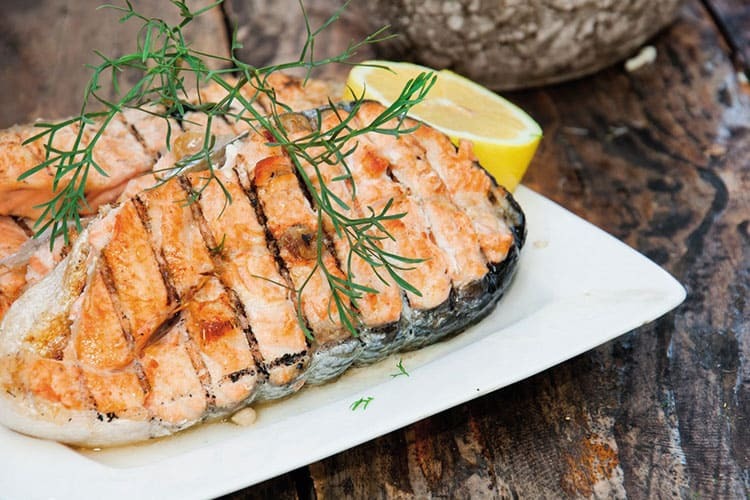 Practically anything can be grilled, yet many unexpected foods are hidden in a meat’s shadow. So it’s time to think outside the grill marks! From meatballs to avocados, French toast to banana splits, grilling will never be the same. Whether you adore grilled meat, fish, or you like grilled vegetables, you have to admit that life without BBQ would be a lot less tasty. Conduction is the process of heat transfer by direct contact of the food to the heat source. The original Foreman grills rely heavily on conduction. Most of us are used to cooking via conduction, especially when it comes to electric grills. Convection or indirect grilling uses some type of fluids (such as air, water, or oil) and will act as a carrier for heat transfer. Indirect grilling occurs when food is not in contact with the heat source. The food is cooked away from the heat and the heat is circulated around the food. Ventilation is important because if the heated air does not circulate it will accumulate only above the food. Radiation cooking is the transfer of heat through waves of pure energy, or by the direct exposure to the heat source. Heat is transferred through waves that can be heat, light or radio. The advantage of radiant heat is that it is more efficient than convection, it gets hotter than convection, there is less dry air motion, and less moisture is lost. 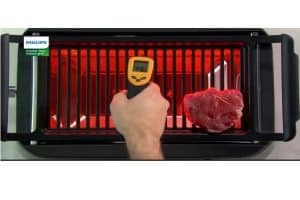 Infrared cooking generates a much higher temperature and can heat up much faster. Together with special reflectors guide, you can achieve evenly grilled food, while leaving the grease tray cool enough to significantly minimize smoke and grease splattering. No matter what the weather is, you can grill your favorite healthy foods indoors. A major disadvantage of using a conventional grill is the well-known fact that there are continuous temperature fluctuations that cause the grill to overshoot and char your food. 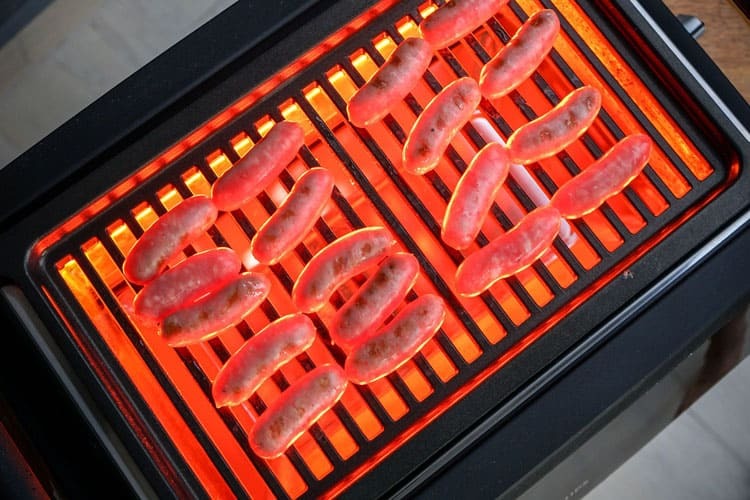 The Philips smokeless infrared grill heats up to the temperature that you tell it to reach and stays there, without any fluctuations in degree. This consistency of temperature allows foods to be cooked with extreme precision. You will be able to grill different types of foods at once and achieve tasty, juicy and evenly browned results with minimal efforts all-year-round, with virtually no smoke. With an outdoor grill, most smoke is caused by fats which fall onto the fire. The oils from fat meats or marinated can flare and cause small fires, which lead to charring the foods. Moving the heat sources to the sides instead of directly underneath the cooking surface like in traditional grills, the Philips infrared smoke-less grill avoids this issue. When fats drip through the grate, they land on a tray plate instead of the heat. Philips create a clean, black-on-black grill with only a single dial, so there’s no need to adjust the heat. 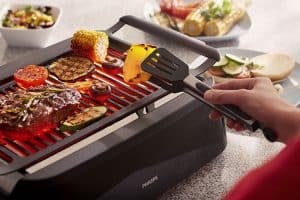 A lot of appliances include hundreds of buttons and knobs with unique functions for each, yet, Philips indoor grill has one dial with only three settings: On, Off, and Warm. They go even further and pinpointed that the perfect grilling temperature is precisely at 446°F. At this temperature, it is hot enough to sear meats while moderate enough to ensure foods cook through before they burn. The grill’s infrared heat, so you’re food is 100 percent consistent across the full cooking surface. The “Warm” function it works pretty good – we used for our burgers for about 15 minutes and it did not dry out. If you’re all about steak and hamburgers, this may be the easiest grill you’ve ever used. The first step is to preheat the grill – it means to turn the “On” function and not the “Warm” setting. Philips recommends preheat for 6 minutes, but we found that 10 minutes works best. When you preheat it will get very hot in your kitchen… yes, you can actually feel the heat! Step away for 10 minutes or open up some windows. Make sure you do not place your grill under any counters – it needs very open space. The non-slip feet will ensure your infrared grill stays in place. For lighter grills, there’s no need to preheat. After preheating, place your foods on the surface and wait for the magic to happen. And here is when the hard part is coming. The grill emits an ominous red glow when in use. 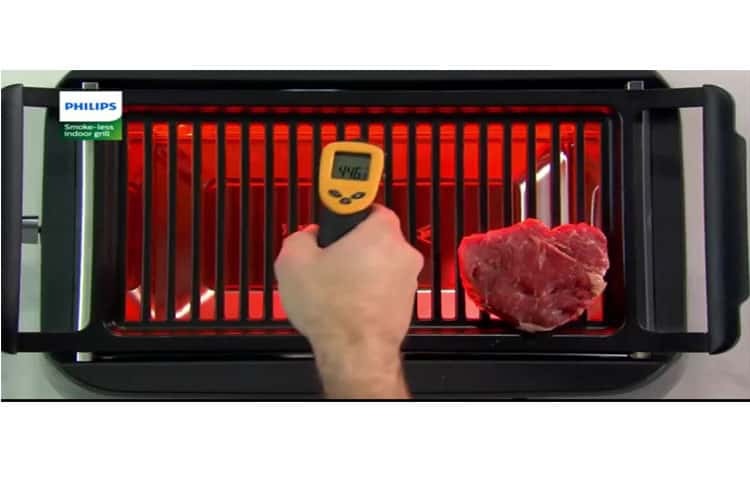 This makes it very hard to see if your meats are cooking properly, because of the infrared light, so use a high-power white light, or cook during the day – that way you can see the “doneness” better. Or, you can use a classic meat thermometer. A piece of advice from our experience: the thicker you cut the meat, fish, veggies, the longer it needs to be on the grill to achieve a perfect consistency. 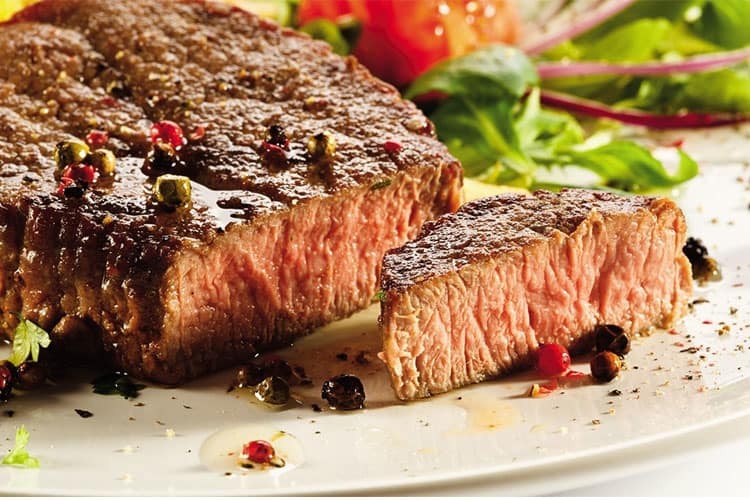 I personally do not like to see too much pink on my steaks, so I keep them on for longer – I’m a well-done lover (include only a trace of pink color but not dry; the steak it will feel spongy and soft and slightly springy). 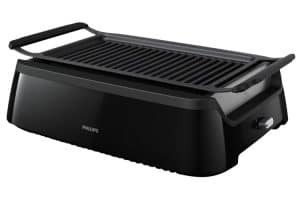 To clean up Philips Indoor Smokeless Grill you need to be sure that the grill is fully cooled down – this takes about half an hour (depending on your ambient temperature). Lift the grates off the surface, get a sturdy nylon bristle brush with dishwashing soap and run it well through the grill using hot water – make sure to go in between to get all the fat that runs down from the foods. The collection tray slides out on a track from the underside of the grill and is dishwasher safe. Some splatters will occur into the internal walls of the unit – scrub them with a sponge, hot water, and dishwashing soap, and wipe it down. The walls of the unit are a bit more difficult to clean though. Remember: the unit should NOT be dipped in water as it would damage the electrical components. In the end, I recommend a quick pass with a towel after each use to return to its pristine condition. Minimal smoke and splatter, except when cooking fattier pieces of meat. Meats are moist, retaining their original flavors or seasoning well. The grill lines on steaks and vegetables are visually appealing. The price tag is a little bit stiff. There is no temperature control, only a knob to turn it On or Off. Get too hot to sit next to the appliance. The grill emits a red glow when in use, which could irritate your eyes. The gaps on the grill rack could be narrower, to prevent smaller pieces from falling when you flipped them. The Philips Indoor Smokeless Grill was designed and made so that you can enjoy grilled food indoors in a clean and agreeable way. This infrared grill cooks your food perfectly while reducing the amount of smoke and oil splattering caused by burning fat. Materials and technology used by Philips are definitely high-quality, and if you love making BBQ for more people at once, this indoor grill is big enough for a party. Sink your teeth into a super-delicious hamburger, a cool recipe made-up by Jamie Oliver and adopted by ChosenFurniture stuff. Skip the prepackaged patties and take the extra time to craft up your own, and that little extra effort will be worth it a lot! And don’t forget the fresh and cool beer. Work the mince in a bowl with your hands to break down the fat. Divide the meat into 4, roll each piece into a ball, then flatten to roughly 1 cm (0,4 inches) thick, so they’re slightly larger than the buns (they’ll get thicker as they cook). Chill in the fridge for 30 minutes. When you’re ready to cook, preheat the Philips grill for 10 minutes. In a small bowl, mix the brown, Worcestershire (or tamari soy sauce) and tomato sauces together – adding as much each as you like. Peel, finely chop and stir in the shallots, then set aside. Halve the buns, then pop them on the grill for 3 to 5 minutes. Grill the burgers for about 3-10 minutes on each side, or until they’re cooked to perfection (according to your taste). To build your burgers, spread the shallot sauce on the warm bun bases. Slice and add the crisp apple (or whatever you like as a fruit), followed by the burger and a nice piece of blue cheese. Finish with a pinch of watercress, then pop on the lids and serve immediately. What Is The Secret to Smoky Flavors When Grilling Indoors? Another downside of using indoor grills is that some people might miss out on the rich, smoky flavor that comes from wood fires. 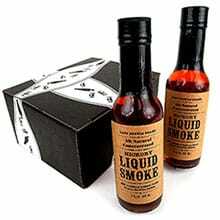 However, there’s always a solution: liquid smoke. In case you don’t know, liquid smoke is smoke that has been captured in steam and turned to a liquid that can be added into any food. Do not worry, liquid smoke it’s FDA-approved and considered a legitimate food additive. To make your indoor-grilled foods absolutely delicious, all you have to do is to brush a little bit of the liquid onto the meat while cooking. Brushing it onto the meat in the final minutes of grilling will give it that smoky flavor even if you’re cooking indoors. OK, some will consider this “cheating”, but in the end, this liquid smoke is the only reasonable solution to give your indoor-grilled meats and veggies that smokey flavor that makes grilled foods such a delicious. Is Indoor Grilling Healthier and Safer? Probably you may have read that traditional outdoor grills can produce chemicals like heterocyclic amines(HCAs) and polycyclic aromatic hydrocarbons (PAHs). PAHs may literally get under your skin and induce cancers. PAHs can be produced from the burning of organic substances, such as coal, gasoline, and wood; HCAs form when meats are cooked using “high-temperature methods”. New studies found that during grilling, people absorbed higher amounts of PAHs through their skin than through the air. Still, the greatest levels of exposure to PAHs occurred through eating the barbecued meats. Vegetables make an ideal grilled food because they aren’t made of protein and don’t create HCAs. Nutritionists still give us the permission to cookouts, saying the cancer risk isn’t great enough to worry about and that certain precautions, such as minimizing grilling time, fire intensity, and trimming the fat from meat beforehand can keep that risk to a minimum. Lower quality indoor grills don’t have the ability to drain liquids as well as outdoor grills and you don’t want marinades running over your counter, so when grilling marinated meats allow them to drain first. While you can baste on an indoor grill, you need to do it softly. Lightly brush basting solutions on foods, careful not to spill out. 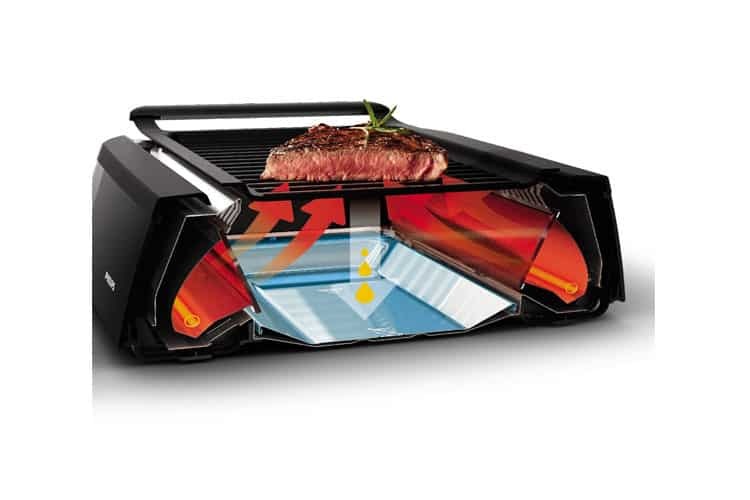 Anyone following a low-carb diet that requires the consumption of large amounts of protein should absolutely own Philips Indoor Smokeless Grill model HD6371-94. Half of the battle for effective dieting is ease of preparation concerning meals, and this grill will help you a lot. With the Philips smokeless infrared grill, you’ll save tons of time and be able to make the kinds of low-carb meals you should be eating. Place your meat on the grill, toss on a few vegetables, and voila – a healthy, really delicious, protein-rich meal can be prepared in a snap! When grilling indoor or outdoor, we knew the less fat we have on meat the less burning and smoke it will spread. Cheap indoor grills can let fat drippings get to the heating elements. This can cause a fire though the risk is very small. Yet, as a safety precocious, keep a fire extinguisher in the kitchen. It is also a good idea to use indoor grills near a kitchen vent or window. Learning to cook with infrared technology is easy, especially if you actually read the instruction manual before you get started. There are also plenty of cookbooks out there you can consult for guidance – not to mention that Philips will give a FREE book if you buy the Indoor Smokeless Grill model HD6371/94. You won’t be disappointed by this technology, believe us, we use it very often. While in summer time it can get your kitchen hot, you can cook foods to perfection. Give it a try! With a power of 1660 Watts, made off high-quality materials, the Philips Indoor Smokeless Grill HD6371/94 will clearly suit your home cooking needs. It makes cooking fast because of its infrared technology, ideal to cook for a family and people living in small spaces. It isn't 100 percent smoke-free, but I'm willing to round up from 90 percent. The grill marks are pronounced and the food is flavorful - now you can grill perfect foods indoors.